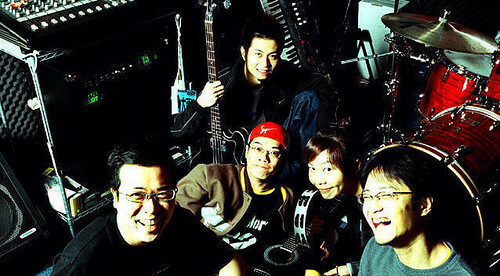 On my trip to Hong Kong in 2005, Tai Tau Fat’s (大頭佛) first album was also a first album of “Chinese independent music” (from Hong Kong) that I picked up. Of the two that I picked up, I totally went by the cover art. Tai Tau Fat’s was interesting because its logo was an imitation of a well-known Hong Kong fast food chain’s called Café de Coral, or “Tai Ka Lok” (大家樂). Tai Tau Fat, which literally means big buddha head, and means a big mess, has existed since 1997 and is still around today, such as on MySpace. They even released an EP this summer appropriately called “I Love Summer”. The music from the 2004 sounded a little more fresh, exaggeratedly cute. In fact, they characterize themselves as “cutie rock”, notably because of vocalist Yan, 阿欣. Their inspirations: USA’s Red Hot Chili Peppers, and Japan’s best in cutie rock, long-dead band Judy and Mary, and duo Puffy.